If you have a bird feeder in your back yard, you may have seen squirrels climbing the pole and helping themselves to the bird seed. Whether you view those fluffy-tailed rodents as unwanted intruders or welcome visitors, their clownish behavior can certainly be entertaining. Unfortunately, those squirrels do not always stay on the outside of your home. Squirrels are among the most common household pests, and also one of the most destructive. A single squirrel can rip apart your attic insulation, damage your wiring and chew through the rafters. A family of these rodents can do even more damage, causing real problems for your home and putting your family at risk. 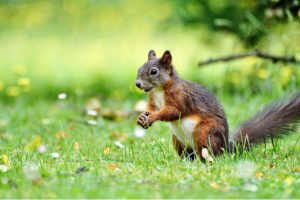 It is not always easy to tell that your home has been invaded by squirrels, especially if you have a large home and they stay confined to the attic. Even so, there are some warning signs to look out for, and the sooner you address the issue, the more quickly it can be resolved. The biggest sign that squirrels have entered your home is the noises that they make. Even a single squirrel could make a lot of noise, so turn off the TV, turn down the radio and listen carefully. If you hear scuffling noises coming from above your head, especially in the morning, it could mean squirrels have entered your attic. If you do hear those telltale scuffling noises coming from your attic, it is time to seek professional help. A squirrel infestation is nothing to fool around with, and you could be seriously injured by a started rodent during your explorations. Instead of trying to deal with the problem on your own, just give Contractor’s Best Pest Solution a call. We are your squirrel control experts, and we know what it takes to remove these troublesome creatures from your attic. We understand the dangers that squirrels pose to your home and your family, and we know the damage they can do if left unchecked. That is why it is so important to deal with your squirrel problem as early as possible, at the first sign of trouble. As with any pest control problem, the best way to deal with a squirrel infestation is to prevent it from happening. If you have trees with overhanging branches in your back yard, make sure they are kept neatly trimmed. Allowing tree branches to grow out over your home could give squirrels and easy point of entry, and once they are in your attic they can be quite hard to remove. You should also check your attic for possible points of entry, including holes or gaps. Sealing these gaps and crevices can stop the squirrels in their tracks, so you can continue to enjoy them in the great outdoors.